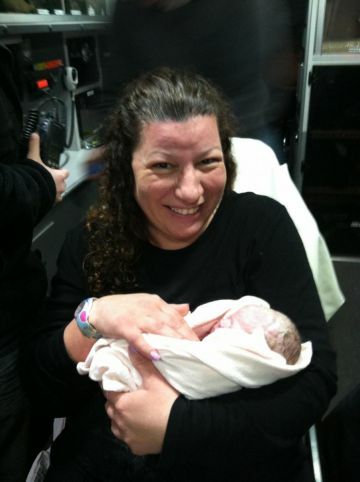 You'll never believe this woman's amazing birth story. Special Deliveries: "I Delivered My Own Baby"
Home births are becoming more popular these days but Dawn Field's birth story isn't quite so common. Field was just trying to take a shower when it happened: "I knew things were not going according to plan," she said. "The contractions came strong and hard and rolling—they were one after another after another." Field's water broke and according to her husband, Jack, the baby started to crown right away. By the time Field's husband called 911 and returned to the bathroom, Field was ready to have her baby—she pulled her daughter out right there in the bathroom. "I got to sign her birth certificate as the one who delivered her," Field said. "How many people actually get to say they delivered their own baby by themselves?" According to Chase Cawyer, M.D., delivering your own baby is doable, though not recommended. "Women can deliver babies on their own and have been doing it since the beginning of time, however having a helping hand is crucial to having the best outcome," Dr. Cawyer explained. "In emergency settings the mom is focused on only one thing: delivering the baby. Her pain is unbearable and she can't focus because of it. Having someone else there can help make sure [the mother stays calm.]"
Dr. Cawyer's thoughts on bathroom deliveries? "A bathroom is no different than other parts of a home. As far as safety goes, a bathroom is just as safe as a bed or a couch, albeit not nearly as comfortable. What a woman shouldn't do is purposely run the bath and attempt a water birth. Water immersion births have not been shown to offer any maternal or fetal benefit and can be associated with serious adverse effects to the newborn. I'd say if you have to or need to deliver in a bathroom or bathtub that's fine, just try and find a pillow because it's not going to be comfortable," he said.